The ORIGIN® STT-1 (tm) is a single channel music recording system offering a selection of Millennia's core vacuum tube -or- solid state circuits, including mic preamps, line input with gain, opto-compressor/limiters, parametric equalizers, DI instrument input with gain, and opto-inductive de-essers. Virtually every audio function is available with 100% Class A, all-discrete J-FET solid state topology or 100% Class A, all triode vacuum tube topology, each topology selectable with the touch of a button. The Origin also offers a choice of colorful transformer-coupled or transformerless audio paths, all switch selectable. Audio transformers provide an extra layer of "preamp personality" ~ what we call Presonality. ORIGIN has been called the Mambo Combo* of all-in-one recording channels and could very quickly become among the only front-end analog paths you'll ever need. With 134 different product combinations in one 2U rack chassis, and the associated range of sonic possibilities, STT-1 is designed for the producer/engineer/musician who doesn't have large blocks of time to spend patching and repatching racks of analog front-end gear trying to achieve "that sound." Now, in one chassis, it's possible to easily and quickly patch Class-A vacuum tube equipment with Class A discrete solid state equipment, transformer-coupling and non-transformer coupling, various inputs and outputs; it's -all- here in one compact chassis. The STT-1 vastly expands the range of every artist's sonic palette at a price/performance level previously unknown in professional audio. 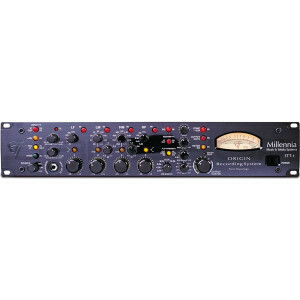 For example, select the transformerless M-2 vacuum tube mic preamp feeding the NSEQ discrete solid state parametric EQ. Or select the transformerless solid state line level input feeding the vacuum tube gain amplifier, routed into the vacuum tube TCL compressor and vacuum tube NSEQ parametric EQ. Or plug an electronic instrument (guitar, bass, etc..) into the vacuum tube DI input and feed this to the solid state gain amplifier, and compress it with the TCL solid state opto-compressor. Or use the acclaimed HV-3 solid state mic amplifier, the choice of top audio professionals worldwide, routed via transformer- coupling to both the direct mic preamp output and NSEQ solid state parametric EQ and solid state de-essing circuits. To select the tube mic preamp, tube line input gain stage, tube EQ, tube compressor/limiter, or tube de-esser, simply press the appropriate front panel switch(es). To use the solid-state mic preamp, s/s line input gain stage, s/s EQ, s/s compressor/limiter, or s/s de-esser, press the switch(es) again. Twin Topology! To use the input transformer, press the associated switch. For transformerless operation, press the switch again. All circuit topologies are designed to deliver a musical optimization of their inherent character. A special collection of vintage vacuum tubes (old Telefunkens & Mullards) are also available for greatly enhanced euphonic character. Twin Topology products also sport new cosmetics. The ORIGIN offers unique illuminated push-button switches, hand-machined solid aluminum knobs, extruded and radiused 3/8" thick face plate which is processed in an artistic 'platinum-crackle' finish (optional) looking something like an aged spruce guitar top. There's even a stylish "TT" (Twin Topology) logo deeply engraved into every panel. A standard "laquer-look" gloss black cosmetic finish is also available at standard cost.